FFIA mediated about 3.500 children to Swedish families during the years 1980 to 2015 under the namn Family association for intercountry adoption. During these years FFIA was authorized by the Swedich central adoption authority.Thereafter FFIA withdrew from adoption activities and made a name change. Today FFIA exists as a support agency for the adoptees. FFIA also run aid projects in some of the countries of origin. Children adopted from other countries are a familiar sight in Sweden. In fact Sweden's small population has the world's highest percentage of international adoptions. For almost fifty years there have been official and organised channels for intercountry adoption to Sweden. From the mid 1960's to the year 2010, about 50 000 children have been adopted from other countries by Swedish families. The official Swedish policy is that the preferences of the sending countries concerning the children's future and Sweden's ability to guarantee the children's security together constitute the preconditions governing intercountry adoption. The Swedish viewpoint is that the scale of intercountry adoptions should hinge on the prospects of providing these children with secure surroundings and family links by means of adoption. The immigration procedures for adopted children are simple and straightforward. There are no conditions governing how many or which children may be adopted with regard to gender, origin, or mental or physical health etc. Each year about 3-400 children of varying ages are adopted by Swedish families. These children originate in more than twenty countries from all over the world. Everyone who is adopted has at times thoughts and questions about his or her origin. Wishing to see the country they come from and to meet the people who might have something to tell them about their history, is natural. 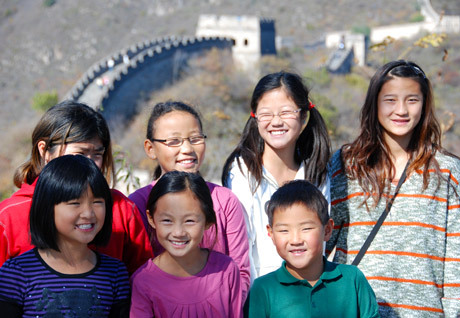 Many families visit their child's country of origin before the child has entered puberty. At this age children are positive towards everything that is new and exciting and can use the experiences in building up their identity. Other families travel later and sometimes adoptees travel alone or with a friend when they are old enough. It is important to everyone that these visits are made with thought and care, in order to respect the integrity and feelings of all persons involved. Many adoptees feel that visiting their birth country has been a very important experience in their personal development.